"Bread Week!" is the theme for this week at I Heart Cooking Clubs (IHCC), where we are currently cooking from Madhur Jaffrey's recipes. There are a number of bread recipes of Madhur Jaffrey's which I've bookmarked, and decided to try out this Naan Bread as it has always been on my list of to-do, so now seems the perfect time to try my hands at making some Naan Bread. The dough is mixed and left to rise until doubled in size. Preheat the oven to the highest setting, mine is 250 degrees, place a baking tray in the middle rack. Divide dough to six small rolls and roll out to an oval shape. Remove the hot baking tray from the oven and place the rolled out naan dough onto the tray. Bake for about 5 minutes until they are puffed up, then transfer the tray to a rack above, under the broiler to brown it, about 1 minute. The puffed up Naan Bread just after baking, lovely with spots of brown. The most exciting part is when the Naan Bread puffs up in the oven, definitely makes me smile when I saw the first one! I made some Hard-Boiled Eggs Masala, which I will post next week, to eat with the Naan Bread. Overall, there is nothing special about this Naan Bread, but I did enjoy eating this with the eggs masala. This Naan Bread is quite plain in taste (I think it needs a little more salt) and perhaps with some added flavours like chopped garlic or cumin seeds or even chopped coriander, would definitely make it much more flavourful. I will definitely try adding some of it the next time when I make this, as I think that even though it is quite plain, it would be great with some flavours added in. To view other breads that my friends are making, do stop by IHCC. Sift the flour, salt and baking powder into a large bowl. Add the remaining 1 tsp sugar, the yeast mixture, 2 tbsp vegetable oil and the yoghurt and egg. Mix and form a ball of dough. Empty the ball of dough on to a clean surface and knead it for 10 minutes or more, until it is smooth and satiny. Form into a ball. Pour about 1/4 tsp oil into a large bowl and roll the ball of dough in it. Cover the bowl with a piece of cling film and set aside in a warm, draught-free place for an hour or until the dough has doubled in bulk. It's Bake-Along time! And for this week, my baking buddy, Zoe from Bake For Happy Kids has chosen Designer Choc Baby Grands for our bake. This is one interesting and very challenging bake! For those of you who are familiar or has baked from Rose Levy Beranbaum's recipes before, would probably know that most of Rose's recipes are mostly out of the ordinary, requiring more steps than any other, rather long-winded, but very informative, I suppose. The same goes for this bake! It takes quite a few steps just to make these cupcakes, but these are no ordinary cupcakes! They are so yummy and you would not stop at just one! And Rose is in the midst of authoring another baking book, scheduled to release in 2015! Now, if Zoe did not choose this cupcake for our Bake-Along bake, I would probably skipped baking this, reading the lengthy instructions is enough to make me turn to the next recipe! All the steps for just a cupcake, let's just see how good it is! The instructions says to fill the cup liners to just under half full, well I did that, at least I thought I did, and these little gems really rose. Some of them rose higher than the top of the liners and am wondering how in the world am I supposed to fill the choc syrup and glaze on top. So I cheated, I cut off the top of the cake. (The little cut off tops got eaten up pretty quickly by my daughter and my visiting niece!) I got 12 cupcakes instead of 14, so it was without doubt, my fault! Next is the preparation of the chocolate syrup. The recipe calls for milk chocolate, but I used semi-sweet dark chocolate as that was what I had. Some heavy cream was heated and mixed into the chopped chocolate and stir till it is all smooth and nice. This syrup is then brushed over the cupcakes, which are first poked with a wooden skewer so that the syrup is easily absorbed by the cake. Repeat till all syrup are used up and a thin coating coats the top. Leave it to set for about an hour. Mine did not set even after two hours, but decided to go ahead with the next step. The next step is the preparation of the chocolate glaze which requires some heating on the stove. Ingredients used are corn syrup, cocoa powder, sugar, gelatin, water and heavy cream. Please do refer to the recipe below on how to prepare this chocolate glaze, it involves some heating and straining. The chocolate glaze is then spooned over the cupcake and leave to set for about an hour. Mine did not set even after a couple of hours. The three kids are getting impatient and have been eyeing this delicious looking cupcake every so often popping into the kitchen and asked whether is it ready! 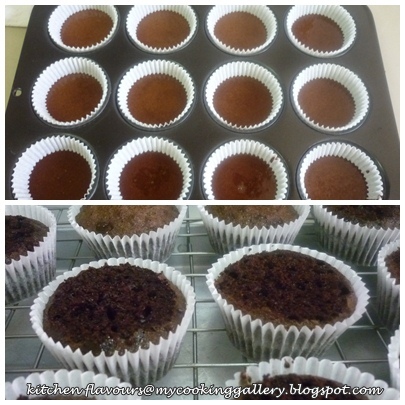 OK, so I took three of these cupcakes and kept them in the fridge, hoping that the choc glaze will set soon. Since the ones outside are still so chocolaty wet, they ate it with a spoon, scoop the cake directly from the cake liners! It was so delicious! The cake is soft and moist, all coated with the "un-set" chocolate syrup and glaze and so chocolaty good! The picture above was taken the next morning, I left the cupcakes in the fridge to set overnight. Look at the shape of the cupcake at the side where the chocolate glaze has flowed, but who's complaining about the shape, when it tastes so good! This is the only one with the smooth top out of the three that I've kept in the fridge, just pretend that it is perfectly round! The chocolate glaze on the top contains some gelatin, so when they set, it is kinda like eating soft jel-like chocolate top! Feedback from the kids, they love it, but they prefer eating these cupcakes with the spoon when the chocolate glaze is still runny and moist. Me included! Would I make this again, I'm not sure! These are very delicious, one of the best chocolate cupcakes I've eaten, but all the washing of the different bowls and time spent on making these, makes me sigh! But I'm glad that this cupcake was chosen, otherwise I would probably shy away from this recipe, and miss out on one super delicious bake! Thanks, Zoe! For our next bake, we will be baking based on a theme bake, where our theme will be Theme : Chocolate Eclairs. The linky will start on 11/12/2012 until 17/12/2012. Do join us, everyone's welcome. Preheat the oven 20 min or more before baking, set an oven rack in the lower third of the oven and preheat the oven to 350°F/175°C. Mix the cocoa and liquid ingredients. In the bowl of a stand mixer, by hand, whisk the cocoa and boiling water until smooth. Cover with plastic wrap to prevent evaporation and cool to room temperature, about 30 min. To speed cooling, place the mixture in the refrigerator. Bring it to room temperature before proceeding. Add the oil and yolks to the chocolate mixture. Attach the whisk beater. Starting on low speed, gradually raise the speed to medium and beat for about 1 minute, or until smooth and shiny, and resembling a butter-cream. Scrape down the sides of the bowl. Beat in the vanilla for a few seconds. Mix the dry ingredients. In a medium bowl, whisk together the flours, sugar, baking powder, baking soda, and salt. Make the batter. Add half the flour mixture to the chocolate mixture. Beat on low speed until the dry ingredients are moistened. Scrape down the sides of the bowl. Add the remain­ing flour mixture. Raise the speed to medium-high and beat for I minute. Scrape down the sides and bottom of the bowl. The mixture will be very thick. Starting on low speed, add the egg whites. Gradually raise the speed to medium-high and beat for 2 mins. The batter will now be like a thick soup. Using a silicone spat­ula, scrape it into a 2-cup or larger cup with a spout. Pour the batter into the prepared cupcake liners. They will be just under half full, 3/4 inch from the tops. Bake the cupcakes. Bake for 15 to 20 min, or until a wire cake tester inserted in the centers comes out clean and the cupcakes spring back when pressed lightly in the centers. While the cupcakes are baking, make the ganache syrup. When the cupcakes are baked, set the pans on a wire rack. Transfer the chocolate syrup to a microwavable bowl and stir in the vanilla. Apply the syrup. Remove the cupcakes still in the muffin pan to a wire rack. While they are still hot, poke about 12 deep holes in each cupcake with a wooden skewer. Brush the cupcakes with syrup. It penetrates most readily when at least 110°F/43°C almost hot to the touch. If necessary, reheat as it cools by giving it a few seconds on high power in the microwave. Allow them to sit for a few minutes, and then apply more syrup to fill the little holes left by the skewer. Continue applying the syrup until all of it has been used. There should be a thin coating covering the top of each cupcake. Allow the syrup to set until, when touched with a fingertip, it leaves no mark, about 1 hr. Make the lacquer glaze. Have ready a fine-mesh strainer suspended over a medium metal bowl. In a small bowl, place the 1/4 cup of cold water and sprinkle the gelatin over the top. Stir to moisten and soften the gelatin and allow it to sit for a minimum of 5 min. Cover tightly with plastic wrap to prevent evaporation and set aside. In a small heavy saucepan over medium heat, whisk together the sugar and 1/3 cup of water. Stir constantly with the whisk until the sugar dissolves. Remove the pan from the heat and, with the whisk, gently stir in the golden syrup and then the cocoa until smooth, making sure to reach into the corners of the pan. The mixture will be glossy. Using a silicone spatula, stir in the heavy cream. Return the pan to medium heat and, stirring constantly, bring the mixture to the boil­ing point (190°F/88°C). Bubbles will just start to form around the edges. Remove the pan from the heat and strain the mixture into the medium bowl. Cool slightly, for about 10 minutes. An instant-read thermometer should register 122 to 140°F or 50 to 60°C. With the silicone spatula, stir in the softened gelatin until dissolved completely and no longer streaky. Strain the glaze into a 2-cup heatproof glass measure or bowl. (Metal will impart an undesirable flavor if the glaze is stored in it.) Cool for a few minutes, stirring very gently so as not to incorporate any air. For these cupcakes, the glaze coats best when just made (80°F/26°C). If the glaze is made ahead and reheated. it will be thicker and should be used at 82 to 85°F or 28 to 29°C. Lift the cupcakes from the pans and carefully remove them from the foil liners, leaving the white inner liners still attached to the cupcakes. Set the foil liners aside. Glaze the cupcakes. Place the cupcakes on a wire rack set on a 17 1/4 by 12 1/4 by 1-inch half-sheet pan or a large piece of aluminum foil to catch the excess glaze. Use a regular tablespoon (not a measuring spoon) to coat the tops of the cupcakes with the lacquer glaze. Smooth it into place with the rounded back of the spoon in a circular motion. Some of the glaze will cascade over the sides and can be reheated and re-poured. Use the aluminum foil as a funnel to pour the excess glaze back into the glass measure. Should they appear, any tiny bubbles can be pierced with a sharp needle. Allow the glaze to set for about 1 hr, or until just barely tacky when touched lightly with a fingertip. Set the cupcakes back in the foil liners. They are at their most shiny within 6 hrs of pouring the glaze. To revive the shine, brush lightly with a soft brush or wave a hair dryer set on low heat briefly over the cupcakes. If desired, encircle them with cupcake wrappers. Do you like eating brinjals? I do, it is one of my favourite veggies. There are different varieties of brinjals, and goes by many names. Interesting facts I've read from Wikipedia, that in Malaysia and parts of the Asian countries, we usually call these veggies Brinjals. The name Eggplants are used in United States, Australia, New Zealand and Canada whereas, the name Aubergine is used in France. There are different varieties of brinjals, the most common ones are the popular purple and white varieties. Of course, each different culture and country have their own special way of cooking this wonderful veggie. One of my favourite way of eating Brinjals, is to cook it in a Chinese stir-fry style. This recipe is from one of my very old cookbook, "Chinese Cuisine". The name of this recipe is actually Fish-Flavoured Eggplants, but there is nothing "fishy" about this dish! It does not have fish or even fish sauce as one of it's ingredient ,so I just called it "Brinjals with Hot Bean Paste". This is a delicious dish to eat with plain white rice. The brinjals are first fried until cooked, which takes only about 2 minutes on each side. Since brinjals tend to soak in the oil during frying, drain them on kitchen paper towels to remove excess oil. And to avoid using more oil than necessary, use a non-stick frying pan. While cooking this, make sure you get the seasoning right, it should be a little sweet, salty and mildly spicy. Even my kids love it. If you are not serving it to kids, you may increase the spiciness by adding in chopped fresh hot red chillies. Cut off the ends of the eggplants. Cut the eggplant into 1/2-inch strips. Heat the wok then add oil. Fry the eggplant strips for about 3 minutes, or until cooked. Remove and drain on kitchen paper towels. In a clean wok, add about 1-2 tablespoon of the oil from (1) above. Stir-fry the ground pork and add ingredients for stir-frying one at a time, stirring after each addition. Return the eggplant to the wok and add in gravy mixture, cook for 1 minute. Add cornstarch solution to thicken, stir. Add the reserved chopped green onions. Transfer to a serving plate, serve hot. 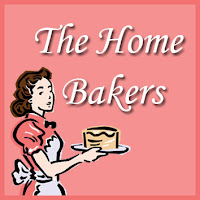 The Home Bakers (THB)'s first bake was on 3rd April 2012, it has been eight months and 11 bakes since then. Our 12th bake today, shall be the last bake for the year 2012. THB is taking a well-deserved break in December and we shall be back again continuing on with the book that we are currently baking from, "Coffee Cakes" by Lou Seibert Pappas, in January 2013. December will be a busy month full of fun festivities and holidays. It's time to be with family and loved ones! And of course, the Christmas shopping! (I'm hoping that Santa will take a peek at my Wishlist over at Amazon, hahaha!) A very Big Thank You to all the lovely members of THB for the support and wonderful bakes these past 8 months where we have completed 12 recipes from the book! That's 48 more to go! We sure had fun, didn't we, ladies? More to come in 2013! For our 12th bake today, this delightful Apple-Walnut Mosaic Coffee Cake was chosen by the lovely Michelle from Piece of Cake. Michelle has proven to be a talented baker and cook, and one very organized baker! Drop by Piece of Cake, make a new friend if you have not met her already! The cake was originally meant to be baked in a tube pan. Upon receiving tips from Mich who has baked this cake weeks in advance (told you she is organized! ), that the cake is very crumbly and advise to bake this in cupcake form. So I did. And with a few changes too. I noticed that the amount of apples is way too much, and Mich did confirmed that as well, so I have cut down the amount of apples drastically! I made half a recipe which calls for 3 cups of chopped apples, which I have reduced to 1 cup only, finely chopped. Other changes I've made is to replace 1/2 cup of the whole-wheat flour to all-purpose flour as I wanted a lighter cake since there are so many ingredients in this bake. I used 1/4 cup of walnuts and reduce the brown sugar to a scant 1/2 cup, and 1/3 cup of dried cranberries. Even with the reduction in the quantity of ingredients, they do seem quite a lot for the batter that seems so little! This amount yields exactly 6 standard-size cupcakes. It smells incredibly nice while baking, and bakes up perfectly. The cake is moist, not-too-sweet and very tasty. Please do visit Mich from Piece of Cake for the full recipe. To view the other members bake on this cake, drop by The Home Bakers (THB). Made these delightful Dinner Rolls and they are so soft and fluffy! The great thing is they stay soft the next day too. The dough is very nice to work with, soft but not sticky. These would be great as sweet rolls, since these are dinner rolls and not really sweet, I might just increase a little sugar and perhaps add in some golden raisins to turn these into sweet rolls. I love soft sweet bread with golden raisins, perfect for tea time and breakfast too. 18 mini balls all in an 8-inch round cake pan. At first, I thought they would not fit in, but they do, perfectly! These little mini balls rose really fast! The earlier ones I've rolled started to rise even before I finished the last one! All puffy and looks really nice and cute, it takes only 25 minutes. Once baked, let stand in pan for 5 minutes, then turn out onto a wire rack, brush the top with melted butter and leave to cool a little. Lovely with a cup of warm tea. In a bowl, sprinkle the yeast and sugar over the warm water and stir to dissolve. Let stand until foamy, about 10 minutes. In a stand mixer fitted with a paddle attachment, combine the buttermilk, sugar, melted sugar, eggs, salt, and 1 cup of the flour. Beat on medium-low speed until creamy, about 2 minutes. Add the yeast mixture and 1 cup of the flour, and beat for another minute. Beat in the remaining flour, 1/2 cup at a time, until the dough pulls away from the bowl sides. Switch to the dough hook. Knead on low speed, adding flour 1 Tbsp at a time if the dough sticks, until a very soft dough forms, about 1 minute. The dough should be softer than typical bread dough, yet smooth and springy. Transfer the dough to an oiled deep bowl and turn the dough once to coat it with the oil. Cover loosely with plastic wrap and let rise at room temperature until doubled in bulk, about 1-1/2 hours. Grease two 8-inch (20 cm) round cake pans. Turn the dough out onto a lightly floured work surface. Divide the dough in half and roll each half between your palms into a rope 18 inches (45 cm) long. Cut each rope into eighteen 1-inch (2.5 cm) pieces. Shape each piece into a ball, and place the balls, sides just touching, in the prepared pans. Cover loosely with plastic and let rise at room temperature until puffy, 30-45 minutes. Preheat the oven to 375F (190C). Bake the rolls until light golden brown, 18-23 minutes. Let cool slightly in the pans or transfer to a rack. Serve warm. ~ once baked, let stand in pan about 5 minutes, transfer out to wire rack and brush the top of the baked rolls with melted butter. "Root, Root, Root, for Root Veggies!" is our theme for this week at I Heart Cooking Clubs (IHCC), where we are currently cooking from Madhur Jaffrey's recipes. For this week's root veggies theme, I decided to cook the humble potatoes! Potatoes are the house favourite, and no matter how these wonderful root veggies are cooked, everyone will dig in for the potatoes first! I love Vindaloo dishes, which usually contains some vinegar, and can be very spicy, level of spiciness is easily adjusted to your preference, and with a mild sweetness. The addition of potatoes in Vindaloo dish is really delicious. The potatoes would have absorbed the taste of the spices and vinegar, and when simmered till soft and tender, is really yummy. When I've first came across this recipe of Madhur Jaffrey's, I knew that this is one dish that I must try. I cooked this dish in the morning, so that the flavours would blend together until my dinner time. Simply reheat it for just a short while over low heat just to warm it up before serving, or it can even be served at room temperature, if you prefer. This recipe does not disappoint me, it is very good. But, I did some changes by doubling the spices! Yes, I love lots of gravy and from the look of the recipe, I can see that there would not be much gravy, so I doubled the spices, which I am glad that I did! So if you would like more gravy to eat with your rice, double the spices! I have omitted the paprika and added in more chilli powder. And the recipe uses 3 cups of water, which is way too much, I only used 2-1/4 cups of water. The recipe states that to add the potatoes and simmer with the pork for 50-60 minutes until the pork is tender. I was thinking that the potatoes would turn to mashed potatoes by that time! So I added in the potatoes after simmering the pork for about 45-50 minutes,when the pork is tender, and continue on to simmer with the added potatoes for another 20 minutes over low heat until the potatoes are tender. By the time the dish is done, the pork and potatoes are coated with the thick gravy and smells good, you can smell the vinegar, really nice, one of the traits of a Vindaloo dish! The delicious tender pork meat and the potatoes are really full of flavours from the spices and vinegar. We had this Goan Pork Vindaloo with Potatoes with some plain Jasmine rice and stir-fried cabbage for our dinner. There was a small bowl of leftover that I was looking forward to have it for the next day, but both my kids took care of that later, they finished that small bowl between themselves, so there was no leftover! To view other delicious root veggies dishes that my friends are cooking, do stop by IHCC. I have given the original recipe as it is, my version for more gravy is indicated in blue. Put half the mustard seeds and all the cumin seeds, coriander seeds and cloves in a clean coffee grinder or spice grinder and grind as finely as possible. Tip this spice mixture into a blender with the onion, garlic, ginger, vinegar, chilli powder, paprika and 3 tablespoons of water. Blend until smooth. Rub 1 teaspoon of salt, all the turmeric, half a teaspoon of freshly ground black pepper and 2 tablespoons of your spice paste all over the pork. Put in a plastic food bag, seal and marinate in the refrigerator for at least 30 minutes or longer if desired. Pour the oil into a large, heavy-based, non-stick, lidded pan and set it over a medium-high heat. When the oil is hot, add the remaining mustard seeds. As soon as they pop, which will be in a matter of seconds, put in the remaining spice paste. Stir and fry for five to six minutes, or until the paste is lightly browned. Add the pork with its marinade and stir for a minute. Cover and reduce the heat to medium. Let the meat cook for about 10 minutes, lifting the lid now and then to stir, it should become lightly browned. Pour in 750ml of water and add the potatoes, half a teaspoon of salt and the sugar. Stir and bring to a boil. Cover, reduce the heat to low and cook very gently for 50-60 minutes or until the meat is tender, then serve. (Let pork simmer for about 45-50 minutes, stirring occasionally, when tender, add in the potatoes, cover and simmer for another 20 minutes until potatoes are tender, stirring occasionally). This is one of the yummiest, softest and fluffiest bread! A truly delicious bread, if you are an onion lover, you will most definitely fall for this bread, as did my family! Give this a try, highly recommended! The good thing is, this bread stays as soft on the next day too! Make the dough as per instructions below, roll it out to the required size. Here I have made one big loaf, and have divided the dough into three parts to make one big braid. My advise is to make into two smaller braids instead, as the big loaf is extremely huge! Refer to the measurement in the recipe below for smaller braids. Place some onion filling, leaving the border 1/2" all around. Roll up dough from the long end close to you, but stop at about 1" from the border, otherwise the fillings would be pushed out. Lift the dough from the other side towards the center to meet the other end of the dough. Seal the dough together tightly. Repeat with the other two parts of cut dough. Place the three rolled filled dough onto the baking sheet, greased or lined with silicone baking mat. Braid the three rolls together, pinching the ends to seal and tuck them under firmly. Leave to rise until puffy about 45 minutes. Bake at 375F about 40 minutes. I took a step further by glazing the top with egg wash and sprinkle with lots of sesame seeds before baking. This is one huge loaf! By the time the dough has risen it can barely fit into my oven. I've got to adjust the loaf by tucking in the ends gently to fit into my oven. So if would be advisable to make two smaller braids instead. Or half a recipe for one smaller loaf. It smells so deliciously good while it is baking. My hubby was a little shocked when he walked into the kitchen. He has never seen a bread this huge before! And it was huge! Hahaha! The size of my cooling rack is a square 14", the bread is definitely longer than that, as I've got to place it across the centre! Look at the texture of the bread. It is so, so, fluffy soft and very delicious! When I was holding the bread in place while slicing it, I can really feel the softness under my fingers, and I knew that this bread is a winner. The onions filling is really good, and I'm glad that I've added the sesame seeds on top. This is one delicious bread, very tasty enough to eat it on its own. And the great thing is, this bread is as soft on the second day! 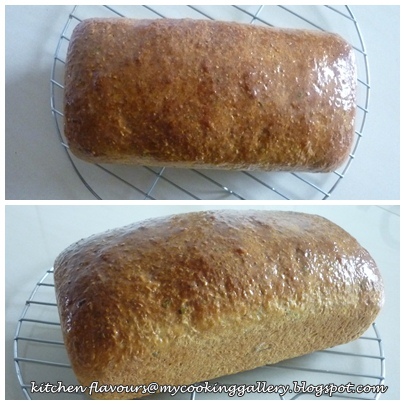 This is one bread that I'll be making again in my kitchen, I hope that you give this a try. Don't miss out on this bread! I am having a good time making different kinds of breads from this fantastic book "Bernard Clayton's New Complete Book of Breads", the Briarpatch Herb Bread and this Onion Lover's Bread are both winners! However I am at first, rather annoyed about the way the instructions are laid out for each recipe. The late Mr Bernard Clayton, (bless him), has given three methods of making, that is by hand, by stand mixer and by using the food processor. But the style of laying out the instructions are pretty confusing, I've got to underline the sentences that are meant for the method which I have chosen, the stand mixer, before I start with the making of the bread. Especially when I first got the book, it was really confusing. It does take a little time to read and understand his style of writing and getting used to. But do not be alarmed by this, once you have understood his style of writing, you are on your way to lots of delicious breads. I'm not annoyed anymore, in fact I'm beginning to appreciate and looking forward to bake from this book even more! Note : The filling is prepared after the dough has been made and set aside to rise. In mixer bowl, stir the yeast and 2 cups flour together. In a saucepan, heat the water, sugar, salt, dry milk and butter (about 125 degrees). When the butter is quite soft, but not necessarily melted, add the egg and pour all the liquid into the flour. Mix at low speed until moistened. Increase the speed to medium and beat for 2 minutes with the mixer flat beater. Stop the mixer, attach the dough hook, and add flour, 1/4 cup at a time, to make a soft dough that forms a ball around the hook as it revolves and cleans the sides of the bowl. This dough must rise before kneading. Cover the bowl tightly with plastic wrap and let the dough rise at room temperature until light and doubled in volume, 1 hour. Meanwhile, make the filling : Melt the butter in a medium saucepan. Remove from heat and stir in the remaining ingredients. Mix thoroughly and set aside until ready to form the braids. Knead using the mixer, add flour, if necessary, to form a soft, elastic ball around the dough hook as it resolves. It will clean the sides of the bowl. Knead for 10 minutes. Allow the dough to relax for 5 minutes and then roll the piece into a 12"x18" rectangle. For one loaf, cut into three 4"-wide strips, or, for two loaves, six 9" -x- 4" strips. If the strips pull back and shrink when they are cut, let them rest for 3 or 4 minutes - and roll to size. Carefully spread the filling on the pieces, leaving a 1/2" margin around the edge. This permits a good bond that will hold and not open when the braids rise. Roll each piece from the long side. Stop the roll 1" from the edge. Lift the edge up to the roll and pinch together. Don't roll to the edge, for this will push the filling onto the clear margin and make it difficult to get a firm seal. Lift the rolls onto the baking sheet and braid 3 rolls together, pinching the ends together tightly. Cover with a length of wax paper and leave at room temperature until the braids have doubled in bulk, about 45 minutes. Preheat the oven to 350F, 20 minutes before baking. Bake on the middle shelf of the moderate oven. When the loaves are a golden brown and tapping the bottom crust yields a hard, hollow sound, they are done, about 40 minutes. (If using a convection oven, reduce heat 25degrees and bake for 35 minutes). Remove bread from the oven. As will all braided loaves, handle the hot bread with care. Move with the help of a spatula to cool. ~ egg wash the top and sprinkle with sesame seeds just before baking. This is one lovely bread, well, not quite a bread, it is a cross between a bread and a cake. But since this recipe is from a book on breads, then I suppose, it is to be called a bread! Whatever name it is called, this is one healthy and yummy bread. It only uses 2 tablespoons of butter, and I just cannot believe just how moist the bread is. All the healthy goodness of oats and fresh orange (zest and flesh), goes into this lovely bread. Instead of milk, this recipe uses warm water, and when I cut the orange, I collected all the juices from the orange and used that too. I did not use the extra 2 tablespoons of sugar (for the orange) as indicated in the recipe, I took the 2 tablespoons of sugar from the 3/4 cup meant for the batter. Even then, this bread is a little too sweet for me. When I make this again, I will definitely reduce the sugar. I use one large orange, so fragrant and juicy. The zest, flesh and juices from the oranges are mixed together with 2 tablespoons of sugar and left for awhile to macerate so that the orange get soaked in its own juices, before they are mixed with the rest of the wet ingredients. The wet ingredients are then mixed into the dry ingredients and stir to combine. Bake for about an hour. Smells incredibly nice while baking! I sliced the bread while it is still warm, and it is a little crumbly, so very moist, and soft. The oats makes the bread a little chewy with interesting texture and the oranges is just delightful. Look at the bits of oranges and oats in it! A slice of this moist bread is perfect with a cup of tea. Baking Pan : 1 large (9"x5") or 2 small (7"x3") baking pans, buttered, then lined with buttered wax paper along sides and bottom. Grate the orange for its zest, then peel. Reserve zest. Cut off the outer white membrane and, with a sharp knife, cut the meat out of each section, leaving the tough sectional membranes intact. Discard the membranes and seeds. Cut the flesh into small pieces and add the orange zest. Sprinkle with the 2 tablespoons sugar and mix well. Set aside. In a large bowl measure the flour, 3/4 cup sugar, baking powder, salt and baking soda. Stir in the rolled oats. In a separate bowl lightly beat the eggs and mix with the melted butter, reserved orange mixture, and water. Blend the liquid into the dry ingredients. Pour the batter into the prepared loaf pan. Preheat the oven to 350 degrees while letting the pan(s) rest for 10 minutes. Bake the loaf or loaves in the oven until a wooden toothpick or cake testing pin inserted in the center of the loaf comes out clean and dry, 1 hour. The baking time will be about 15 minutes less for small loaves. (If using convection oven, reduce heat 50 degrees and bake the large loaves for 50 minutes and the smaller ones for 35 minutes). Remove the bread from the oven. Carefully remove the bread from the pan(s), tugging gently on the wax paper to loosen it. Allow to cool slightly on a metal rack before serving. Delicious served warm, spread with sweet butter. "Comforting Curries" is our theme for this week at I Heart Cooking Clubs (IHCC), where we are currently cooking from Madhur Jaffrey's recipes. Once again, I could not decide which curry recipe to choose from! Finally decided to cook this simple Madras Fish Curry since I already have two slices of mackerel fish in my freezer that I bought a couple of days before. This recipe uses 2 cans of canned tomatoes to be finely chopped. I used only 1 can of chopped tomatoes as I do not want the dish to be too sour and did not bother chopping them finely. The whole can goes into the saucepan as I figured after simmering for half an hour, the tomatoes should break down. Of course, the other ingredients, the spices, what is a curry without all the fragrant spices. At first I find that there is nothing special or spectacular to the sauce after I've cooked this dish. What I can taste is just a little sour, nothing much else! So for me, this dish is a "so-so"! Maybe by using fresh ripe sweet tomatoes would be better. About an hour or so later, when my kids had their dinner, they were spooning for the sauce and keep on taking more of the sauce. I was rather surprised and thought that they would not like this dish. They loved it. Later when I ate the curry with some rice, I find that it tasted much better than earlier, the flavours must have blended when left for an hour or so, as most curry dishes do. Though it tastes so much better, I'm not in a hurry to cook this dish again. There are lots of other curry recipes that I'm eager to try! To view other delicious curries that my friends are cooking, do stop by IHCC. Put the onion, garlic, ginger and vinegar in a blender or food processor and blend to a smooth paste. Put the oil in a large, wide pan, preferably non-stick, and set it over a medium-high heat. When it is very hot, put in the cumin, fennel and fenugreek seeds and let them sizzzle for 5 seconds. Quickly pour in the paste from the blender, using a rubber spatula to get it all out. Stir and fry it for 10-15 minutes, until it is golden brown. Add the ground coriander, cumin and turmeric and stir for a minute. Add the tomatoes, cayenne, garam masala, salt and lots of black pepper. Cook, stirring, for another 2-3 minutes. Stir in the water and bring to the boil. Cover the pan, reduce the heat to low and simmer very gently for 30 minutes. Add the fish in a single layer. Simmer gently, spooning the sauce over the fish, until it has just cooked through. Our Bake-Along #35! My turn to select a theme, and I have chosen to bake any Linzer Tart/Torte as our baking theme. Linzer Tart, sometimes called as Linzer Torte, is believed to be originated from Austria, from the city of Linz. Torte is a German word for cake. It is a round tart with a pastry base and is topped with raspberry jam and the top is attractively crisscrossed with strips of the pastry dough. An interesting fact I discovered about Linzer Torte is, it is known to be the oldest kind of cake in the world, dated back to 1696! As you can see from my photo above, I have over baked the tart a little, the crust is a little too brown for my liking. This tart has however, helped me in my "project" to clear my pantry, a bottle of raspberry jam that I have no idea how it came to me, but has been sitting in my pantry for months! The recipe uses unblanched almonds which are processed with the confectioners' sugar till fine, but I use ready bought ground almond instead, so I skipped this step. The dough is really very soft and difficult to work with. I need to refrigerate the dough in the freezer for a short while and work quickly when handling the dough. It came out fine in the end! As you can see, the jam is not suitable for baking. It is runny while still hot and did not improve much when the tart has cooled down. I refrigerated the tart to set the jam. It was fine when out of the fridge, but the jam starts to turn runny later on when left outside. So I left the tart in the fridge until serving time. And this jam is a litttle too sweet for my liking. Overall, this Linzer Tart is not too bad, albeit the sweet jam. I guess that good quality jam certainly makes a big difference, and next time I'll use preserves instead! But anyway, at least the bottle of "mysterious jam" has been cleared off my pantry! This goes to my self-project in clearing my pantry Clearing my pantry #2 : Raspberry Jam! For our next bake, we will be baking Designer Chocolate Baby Grands, from Rose's Heavenly Cakes by Rose Levy Beranbaum or here. The linky will start on 27th November right up to 3rd December. Do join us, everyone's welcome. In a bowl, sift together the flour, cinnamon, cloves and salt into a bowl. Using the finest rasps on a handheld grater, grate the zest from the lemon into the bowl. Set aside. In a food processor, process the almonds with the confectioners' sugar until finely ground. Set aside. Using a stand mixer, beat the butter with the paddle on medium speed until creamy. Beat in the almond mixture, then 2 of the egg yolks. Reduce the speed to low, add the flour mixture, and beat just until combined. Flatten about a third of the dough into a disk, wrap in plastic, and refrigerate. Grease a 9-inch (23cm) round fluted tart pan with a removable bottom. Using your fingers, press the remaining dough into the bottom and up the sides of the pan, extending it about 1/2 inch (12mm) above the rim. If the dough is overly soft and sticky, refrigerate it until firm enough to continue. Spread the dough with the jam. On a lightly floured surface, roll the chilled dough into a rectangle about 9 inches (23cm) long and 1/4 inch (6mm) thick. Using a fluted pastry cutter, cut into 6 strips, each 1 inch (2.5cm) wide, 2 of them should be 9 inches (23cm) long and the others shorter. Lay the strips on the torte, trimming the edges. Fold the dough extending above the pan back over the filling and strips. Crimp to seal the edges. Place the torte in the freezer for 20 minutes. Preheat the oven to 350F (180C). In a small bowl, whisk together the remaining egg yolk and the milk. Brush the dough with the yolk mixture. Bake until the crust is browned and the jam is bubbling, 45-55 minutes. Let cool on a wire rack until the torte is barely warm. Let the pan sides fall away. Run a thin-bladed knife between the torte and the pan bottom. Transfer the torte to a serving plate and let cool completely. Just before serving, using a fine-mesh sieve, dust the torte with confectioners' sugar, if desired. This is one amazing bread! This amazing recipe is from Bernard Clayton's New Complete Book of Breads, and Mr Clayton originally got this recipe from a herbalists, Pearl Lloyd who grew more than 150 types of herbs in her private herb garden. This bread uses four types of herbs, oregano, chives, basil and parsley. According to the book, ideally the herbs should be fresh, but dried can be substituted. I used fresh chives and fresh basil from my garden, and dried parsley and oregano. It was one of those Sunday late morning, where the family went out for a late breakfast and naturally we skipped lunch. So I made this bread as a late afternoon tea time snack. The full recipe makes two loaves, but since I do not want to keep any leftovers as I am pretty sure that we cannot finish two loaves, I made half the recipe for one loaf. I used the stand mixer to mix the dough, and the dough was pretty sticky. Sprinkle some flour over the dough when shaping the bread and it is much easier to handle with dry clean hands. I made it sightly lighter by replacing some of the whole-wheat flour with white bread flour. The bread is simply amazing. Smells incredible with the herbs and it has a soft texture, and very tasty. I sliced it about 40 minutes after I took it out from the oven, while it is still slightly warm and delicious! This is not a very tall bread, and it did not look very impressive, but it is wonderfully soft and moist. Makes a perfect sandwich bread. According to the book, this bread freezes well. We had the bread with some slices of ham and cheese. I do not have any veggies in my fridge at that time, though with some cut slices of tomatoes, cucumber and lettuces would be lovely. Thumbs up from the family, everyone loves the bread. It was very good too spread with some salted butter, yum! I have no idea how this bread would fare on the second day, as we finished the whole loaf that very day! Definitely will be making this wonderful healthy bread again, for one of our "sandwich days"! 2 medium (8-1/2"x4-1/2") loaf pans, greased or Teflon. Measure 1-1/2 cups flour into a mixing or mixer bowl and stir in the yeast, sugar, and dry milk. Pour in the hot water. Blend into a thin batter. Break in the egg and add the parsley, oregano, nutmeg, chives and basil. Beat this mixture in a mixer for 2 minutes. Allow the mixture to ferment and become bubbly, about 15 minutes. There is no need to cover it for this short period. Add cooking oil, salt, and 2 cups whole-wheat flour to the mixture and beat with a wooden spoon or with the mixer flat beater until the flour has been worked into the batter. Let stand for 3 minutes to allow the whole-wheat particles to fully absorb the moisture before adding more flour. Alternate between the white and whole-wheat when adding small portions of flour to form a rough shaggy ball of dough. Knead with the dough hook for 8 minutes. Grease the mixing bowl, drop in the dough, cover tightly with plastic wrap, and leave at room temperature to rise until double in bulk, about 40 minutes. 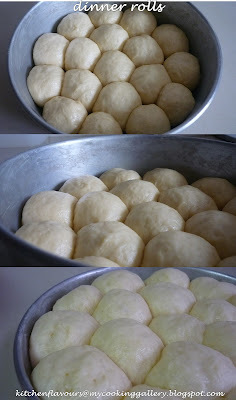 Divide the dough into 2 pieces and shape each into a ball. Press each ball into an oval roughly the length of a bread pan and fold in half lengthwise. Pinch the seam to seal, and place in the baking pan with the seam under. Cover the pans with wax paper and leave to rise until the dough reaches the height of the pan, about 35 minutes. Preheat the oven to 400 degrees, 20 minutes before baking. Place the pans in the oven and bake until golden brown with flecks of herbs over the crust, about 35 minutes. Turn one loaf from its pan and test for doneness by tapping the bottom with a forefinger. If it is hard and sounds hollow, the loaves are done. If not, return them to the oven for an additional 8 to 10 minutes. (If using a convection oven, reduce heat 50degrees). Turn the loaves out onto a metal rack to cool before slicing. While still hot, brush the bread with the melted butter. Kam Heong Sotong is truly a Malaysian favourite. "Kam Heong", is a Cantonese word when translated directly, means "Golden Fragrance". Just as it's name, this dish smells really good. It is usually served in Chinese restaurants, and can be cooked with various seafood and even chicken meat. The other popular seafood that is usually cooked this way is our local clams, which we called "lalah" and also delicious with fresh crabs. We would sometimes order this dish when we eat out at Chinese restaurants, either clams or sotong (squid). Whenever this hot piping dish is served at the table, the fragrant smell will make your saliva glands starts working immediately! You could cook this at home, but be prepared to buy more squids, as once they are cooked, they sort of "shrink"! And cook lots of rice, you would want a second helping! What you need is lots of fresh curry leaves, it brings a wonderful fragrance to this dish and a fair amount of dried prawns. My Curry Leaf Plant. Curry Leaf is easily obtainable from any wet market or supermarkets in Malaysia, and very cheap too, but then, having your own plant is definitely more convenient. I grew this plant in a pot, it is not a very big plant, but it provides me with the most vibrant green healthy fragrant leaves. The spiciness of this dish depends on the amount of bird's eye chillies used, and for an even spicier taste, a pinch of chilli powder may be added in as well. If you prefer less spicy, use 2 or 3 bird's eye chillies. Here, I have used only 2 since my kids are eating this as well, and I have chopped it to large chunks so that it is easier to remove when serving to the kids. For extra spicier kick, chop the chillies finely so that the heat from the chillies gets distributed throughout. If a drier dish is preferred, do not add any water during cooking, but my family is a "gravy-loving family", we love gravies to eat with our rice, so I have added in about 3 tablespoons of water just for a little gravy, not too much though, as this is a fairly dry dish. Dried prawns is a must for this dish, otherwise it would not be the same, the dried prawns are soaked to soften first, then chopped to small pieces and fry till fragrant and crispy. The squids are sliced to rings and marinated with some corn flour, to keep them soft and tender during cooking, as squids tend to turn rubbery and tough if cooked too long. The squids are stir-fried for a minute to briefly pre-cook them, remove and added in to the curry sauce later for a quick stir. Really fragrant from the curry leaves, dried prawns and curry powder. We just love the thick saucy gravy, with bits of garlic, shallots, dried prawns all coated with the delicious fragrant sauce that is a little spicy and salty with a tinge of sweetness. I could eat my bowl of rice with just this one dish alone! Clean squid, cut to rings, marinate with 2 tsp cornflour and set aside. This is to tenderize the squid so that they will be tender and nice during cooking. Heat about 1 tablespoon cooking oil in a wok or saucepan. When oil is hot, add in squids and stir-fry for about 1 minute. Scoop to a plate, keep aside. In a clean wok or saucepan, heat about 3-4 tablespoons cooking oil. Add the chopped garlic and shallots, saute for about 3-4 minutes until fragrant and light brown. Add in chopped dried prawns and fry till dried prawns are fragrant, light brown and crispy. Add in the curry leaves, bird's eye chillies and lemongrass. Stir fry for another minute or two until the curry leaves releases its fragrance. Add in the curry powder, stir for a few seconds to combine and add in the squids, plus whatever juices has accumulated on the plate. Add a few drops of black soy sauce, sugar and salt to taste. If a little gravy is preferred, add in about 2-3 tablespoons water. Stir for a minute or two. Scoop out to a serving plate and serve hot. Enjoy!